A few days ago Brad mentioned that he’s been waking up in the middle of the night refreshed and ready to do some work, but he goes back to sleep. I happened to find an article that talks about how people in the old-timey days used to sleep in two chunks: four hours or so, then get up and do stuff, then back to sleep until daylight. At first it seemed like they were super-human go-getters, but now I realize that it was just dark. See, Tuesday night Lloyd was at Bad Movie Night and I was home alone. It started to rain – and actually thunder! 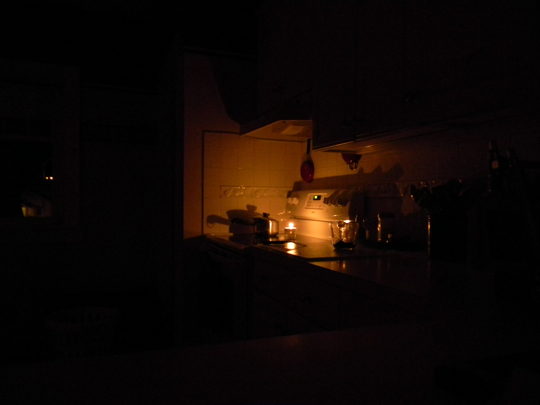 – and I lit a candle hoping we’d have a power outage in case the electricity went out. Well, you light one candle- you gotta light two. Maybe you throw a dish towel over your computer screen until it goes to sleep and it’s nice and dark in the house with just (squeee!) candlelight. Ahh…. it was very relaxing. There is a website I like where a couple lives in a tiny cabin with no electricity and just light their house with beeswax candles and their fire. I love looking at their house, and it brings me a sense of peace. I puttered around the kitchen, tidying up and hand-washing a few dishes and feeling very Little House on the Prairie. Then I started to tidy up the dining room table, but it was too difficult to read if envelopes were junk mail or Important Mail, and it was making my eyes hurt. I went back to the kitchen to do a little more work – like taking a looooooong time to fill the soap dispenser. Then I was sleepy. Really, really sleepy. I think only ten minutes had elapsed. Zoinks! Can you imagine living in a house with no bright lights at night?? Good grief! I’d be passed out by 6 every night! No wonder those people got up at midnight to do some work – they’d already had a full night’s sleep. They’d go back to bed after knitting a sweater or whatever? They weren’t over-achievers – they were people who took a long nap after their solid night’s slumber. And that is something I can get on board with. The description of that sleep cycle sounds so interesting to me. I don’t tend to get much work done in the evenings anyway, so what would it matter if I went to bed at 5pm? But sometimes I have to stay up until 8 or 9 to do choir or church council. I’m already grouchy at meetings. How much more grouchy would I be if I were up four hours past my bedtime? I love the idea of 1st sleep & 2nd sleep! It’s right up there with 1st & 2nd breakfast! And now Brad has got me wondering….if I did go to bed right after dinner, would I be able to get up later & be productive, or would I just watch my recorded TV?!? This may call for an experiment.